Smoked Haddock Risotto Recipe - Easy & Delicious - Ready in 20 Minutes! A delicious and simple Smoked Haddock Risotto recipe. Perfect for adding fish to your midweek meals, include peas or spinach for a complete one pan dinner. This post is an ad sponsored by The Saucy Fish Co. Thanks as always for supporting the blog. There’s nothing quite like the comforting carb-fest of a bowl of creamy risotto. 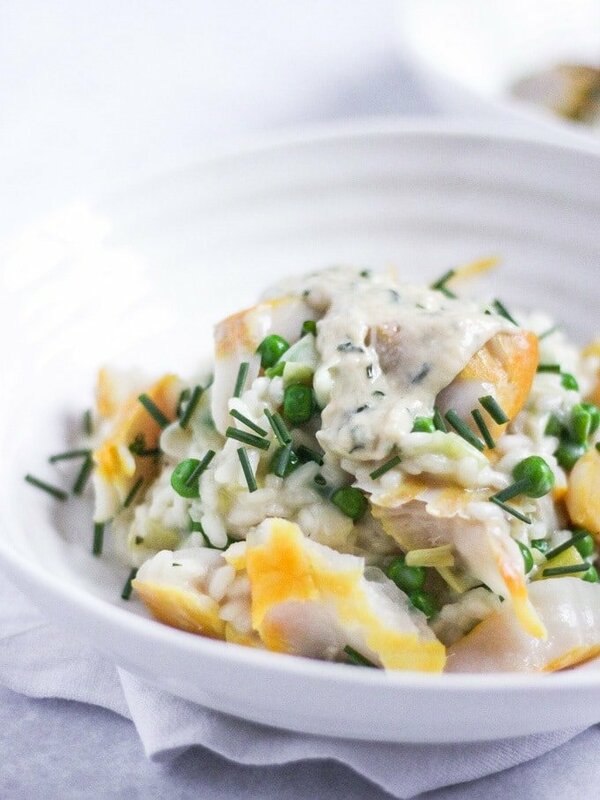 This Smoked Haddock Risotto is rich and tasty but super simple to make. For me, that welcoming bowl of rice just says “all is okay with the world”. It’s the perfect winter supper, and is a sure fire winner when entertaining too. The people at The Saucy Fish Co. got in touch with me recently and asked me if I’d like to try out their Smoked Haddock with Vintage Cheddar and Chive Sauce. I’m always looking for ways to encourage us to eat more fish as a family, honestly? I’m a bit rubbish at remembering to put it on our meal plans. I knew that this haddock would be just perfect in a creamy risotto. 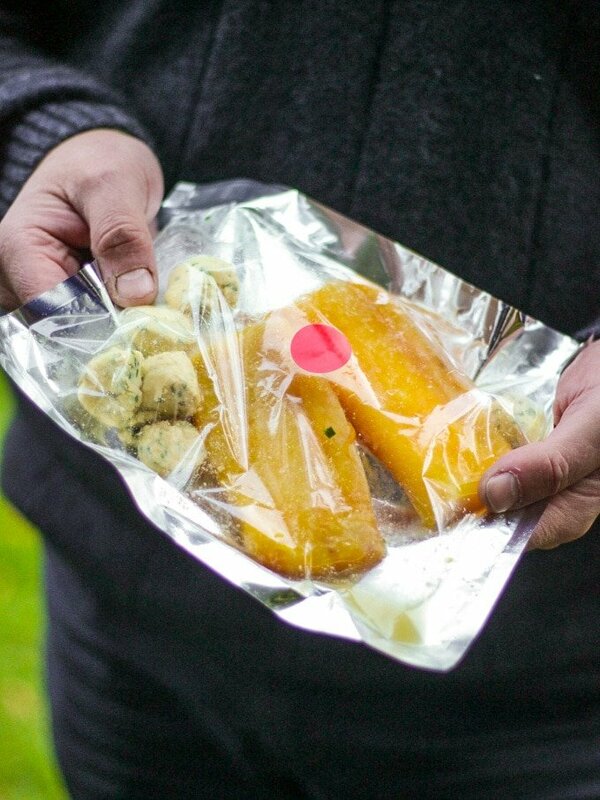 Somehow, cooking fish midweek can feel like a bit of a faff BUT the people at The Saucy Fish Co have solved our fishy dilemmas with these super clever little foil bags. This part of their range include fillets of fish, with a sauce (they look like knobs of butter when uncooked) in a foil backed bag. You bake them, unopened, in the oven and after 15 minutes, the fish is cooked in a pool of delicious sauce. No handling the raw fish, no preparation. It’s fish but without the fuss! I was so impressed by these foil pouches, particularly how easy they were to use and how tasty the sauce was. It could easily have been homemade. Shhh, I won’t tell if you don’t?! 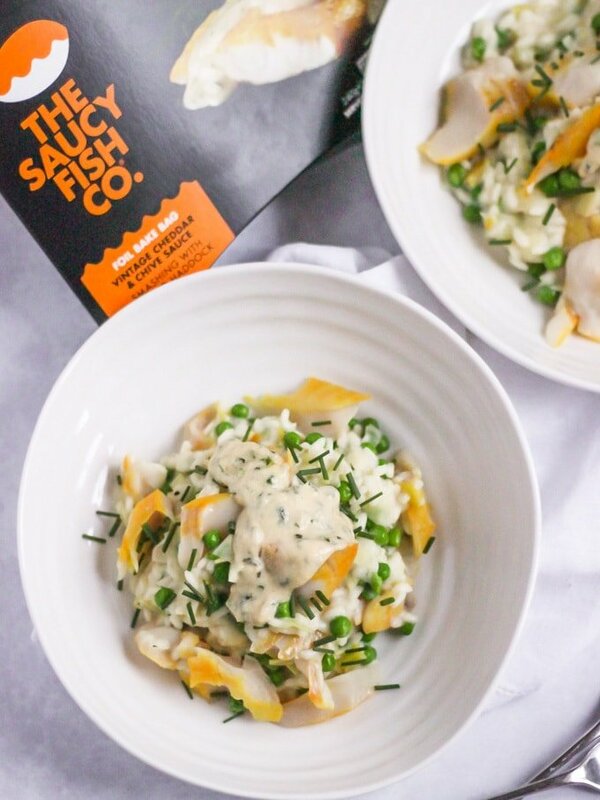 You can buy this Saucy Fish Co product in Sainsbury’s, online at Ocado or also online directly on their online shop: The Saucy Fish Co.
How long does it take to cook a smoked haddock risotto? The secret to the perfect smoked haddock risotto is the addition of lots of stock, whilst continually stirring the rice over a low heat. The process of stirring releases the starch from the rice giving you that creamy texture. Can you use normal rice for risotto? I have used arborio rice in this smoked haddock risotto, but you could also use long grain white rice. My top tip would be to use arborio where possible as it gives a much creamier end result. 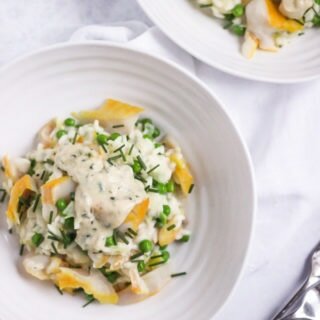 Can I freeze smoked haddock risotto? 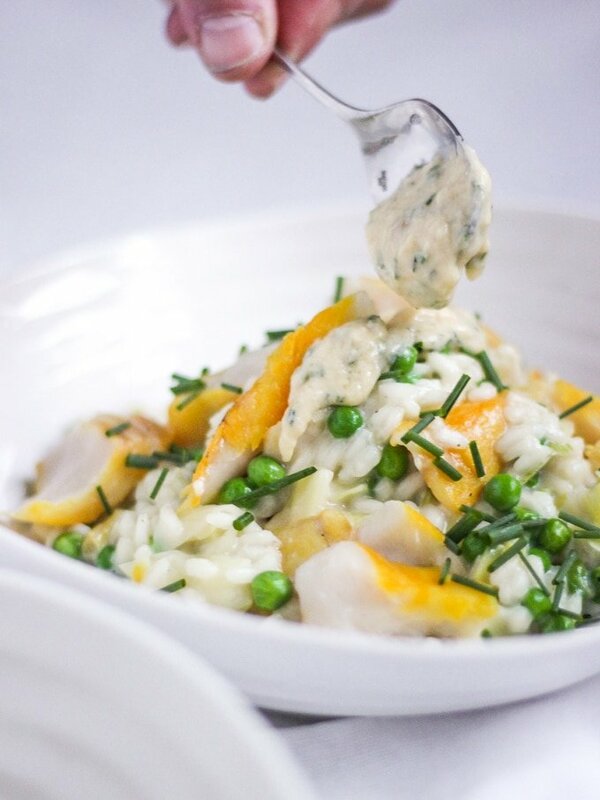 This Smoked Haddock Risotto is best eaten as soon as it is made. If you have leftovers you can store them in an air tight container in the fridge for a couple of days. To do this so it should go straight into the fridge as soon as it has stopped steaming, at the very most 1 – 1 1/2 hours after cooking. It goes without saying that you should ensure it is piping hot throughout when reheating. Whilst you can freeze Smoked Haddock Risotto, cooked rice can become hard which would alter the texture of your risotto. If you do freeze it you should defrost over night in the fridge and reheat slowly on the hob until it is completely heated through. You might need to add a little more water or stock too when reheating. As you’ll see I poured The Saucy Fish Co. sauce over the risotto, you could stir the sauce through and add some extra cheese on top if you prefer. You can swap peas for spinach if you prefer. 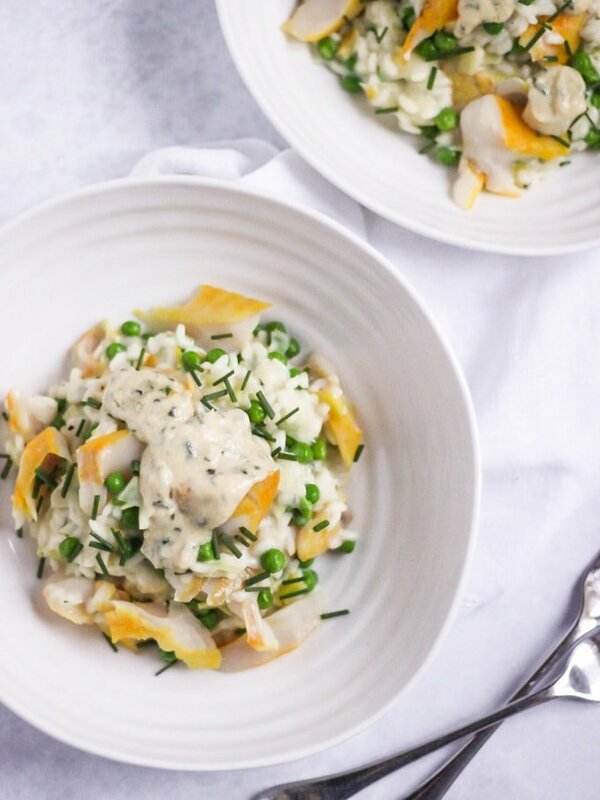 The secret to the creamiest Smoked Haddock Risotto is pretty much constant stirring, you should add the stock a spoonful at a time, ensuring that all of the liquid is absorbed before adding more. You could also try making it in the oven by following the steps in my Oven baked bacon and tomato risotto recipe. 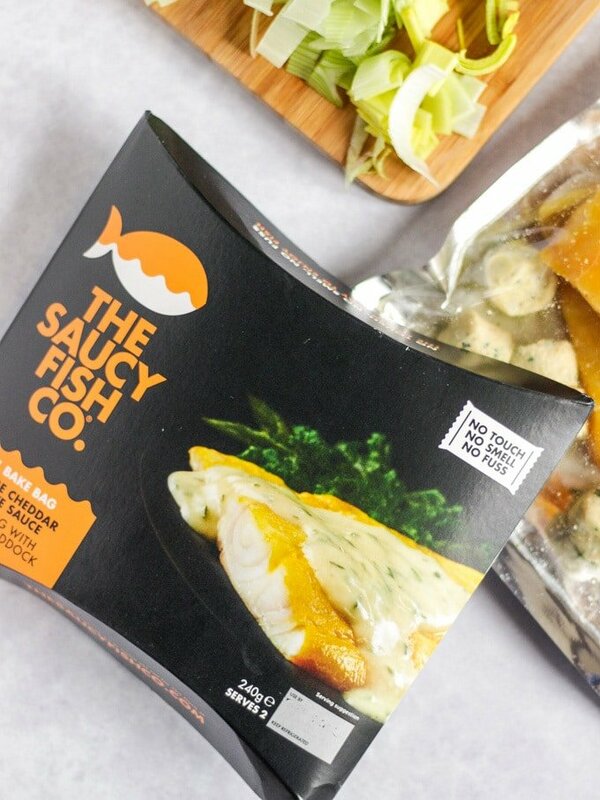 The Saucy Fish Co.’s frozen range, of fish and sauce combinations and saucy-centred fishcakes has just launched in The Food Warehouse by Iceland. Find more about The Saucy Fish Co. on Twitter, Instagram and Facebook. If you are looking for some more mid week inspiration then have a look at my Beef Bourguignon or Lamb Tagine recipes, perfect for the chilly weather that’s now set in! Hope you enjoy this recipe as much as we do. 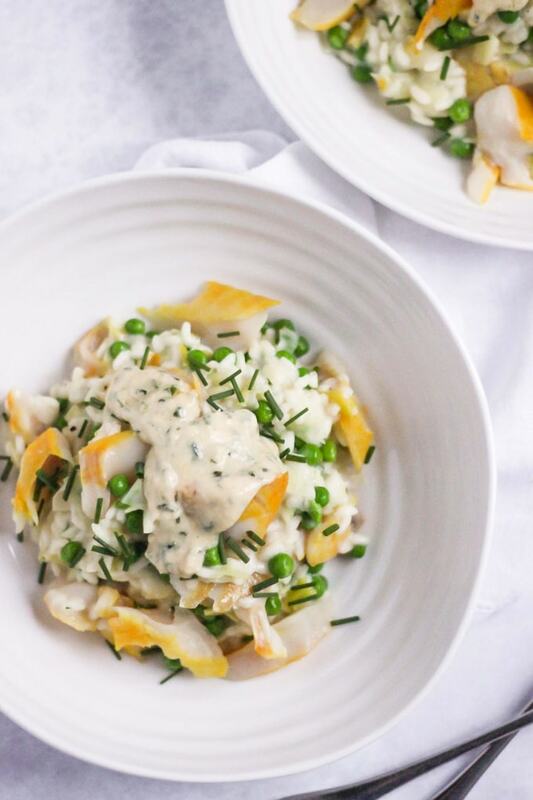 I’d love to know how you got on and what you thought of it if you make this Smoked haddock risotto recipe. Please rate the recipe and leave me a comment below if you do. Melt HALF of the butter in a large saucepan and add the leeks, cook over a medium heat for 3 - 4 minutes until starting to soften. Meanwhile, put The Sauce Fish Co. foil bag into the oven on a baking sheet and follow the cooking instructions. Add the rice to the saucepan and cook, stirring for 1 - 2 minutes. Gradually add the stock, a ladle at a time, stirring all the time. Try to add the next ladle when the one before has been absorbed. Do the same with the milk when the stock is all gone. This whole process will take 15 - 20 minutes. The rice should still have some 'bite' and texture to not be overcooked. Take the risotto off the heat, add plenty of salt and pepper, the peas and the remaining butter. Break up the fish and stir through too (the heat in the risotto will just warm the peas through). You can either stir through the sauce of the fish, or pour over when you serve.